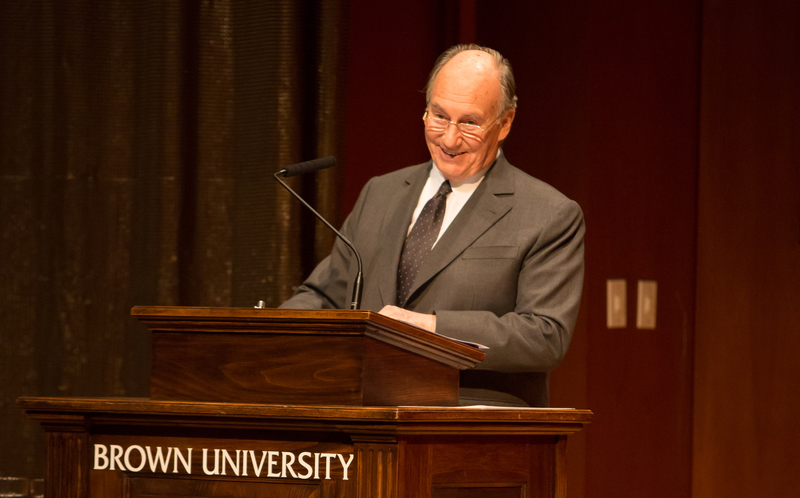 His Highness the Aga Khan delivers the 88th Ogden Memorial Lecture in International Affairs at Brown University. Providence, USA, 11 March 2014 — The Aga Khan yesterday warned that the growing power of social media does not always mean more connection between people. He cautioned that the shallowness of new media, intellectual isolation and mutual ignorance are adversely affecting relations between Islam and the West despite the highly interconnected world of today. “Fearful ignorance” must be replaced with “empathetic knowledge,” argued the Aga Khan, by ensuring a thoughtful, renewed commitment to the concept of pluralism and a strong civil society. The Imam (spiritual leader) of the Shia Ismaili Muslims made the remarks during the 88th Stephen A. Ogden Jr. ’60 Memorial Lecture on International Affairs that he gave at Brown University, as part of the college’s 250th anniversary celebrations. The Aga Khan explained that civil society can assist in creating new governance frameworks as it has done recently in Kenya, Tunisia and Bangladesh, particularly when one understands that there can be no “one size fits all” answer, and the outcomes will be varied. “I believe that the voices of civil society can be among the most powerful forces in our time. Where change has been overdue, they can be voices for change. Where people live in fear, they can be voices of hope,” he said. In his lecture the Aga Khan warned that a worsening knowledge gap between Islam and the West could become an empathy gap, making it harder to remain open to others. “The struggle to remain empathetically open to the Other in a diversifying world is a continuing struggle of central importance for all of us,” he said. The Aga Khan said the knowledge deficit between civilisations – but also conflicts within them – have fueled strife across the world. “The harsh truth is that religious hostility and intolerance, between as well as within religions, is contributing to violent crises and political impasse all across the world, in the Central African Republic, in South Sudan and Nigeria; in Myanmar, in the Philippines and in the Ukraine, and in many other places,” he said. It is these forces of fragmentation that “can threaten the coherence of democratic societies and the effectiveness of democratic institutions.” For instance, the increasing conflict between Sunni and Shia Muslims in a number of countries around the world is “becoming an absolute disaster”. The Aga Khan, who received an honorary doctorate from Brown University in 1996, expressed his admiration for the role that great universities play in responding to governance issues in the developing world, including Muslim societies. His Highness the Aga Khan is the 49th hereditary Imam of the Shia Ismaili Muslims, and founder and chairman of the Aga Khan Development Network (AKDN). He has been deeply engaged with international development for close to 60 years. His Highness was accompanied to Brown University by members of his immediate family including his son, Prince Rahim Aga Khan, who is a graduate of Brown’s class of 1995. Established in 1965, the Ogden Lectureship has presented Brown University and its neighbouring communities with authoritative and timely addresses about international affairs with the goal of advancing international peace and understanding. Past distinguished speakers include Dr. Jim Yong Kim, President of the World Bank; King Hussein of Jordan; Mikhail Gorbachev, former President of the Soviet Union; His Holiness the 14th Dalai Lama of Tibet; Paul Volcker, Former Chair of the Federal Reserve; as well as other senior diplomats and observers of the international scene.